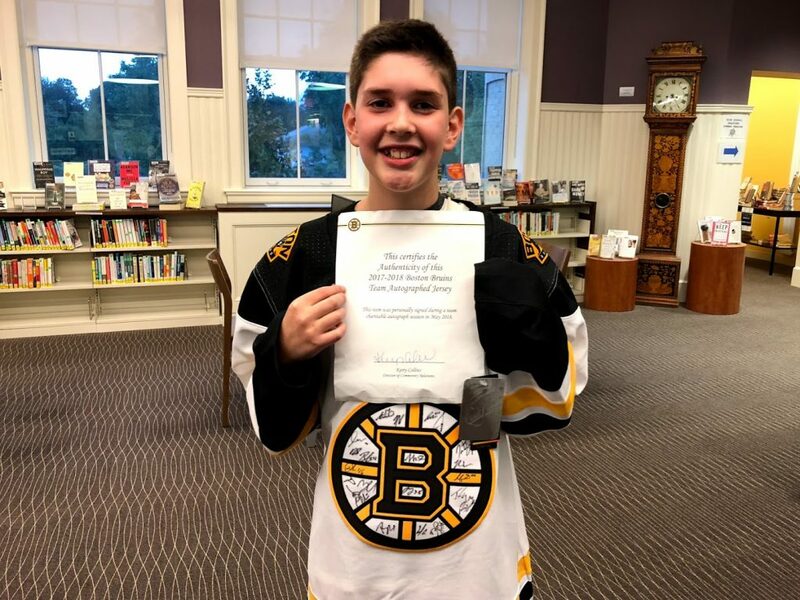 Aaron Fusco is one of a select group of young people to receive Boston Bruins prizes for their outstanding participation in Reading Public Library’s teen summer reading program. When program sponsors, the Boston Bruins, the Massachusetts Board of Library Commissioners (MBLC), and the Massachusetts Library System, asked public librarians to make nominations, Susan Beauregard and Renee Smith, Teen Services Librarians, knew just the person. “We have many, many wonderful young people in our program, but Aaron’s dedication and enthusiasm was unparalleled,” said Renee Smith. The Bruins first teamed up with the MBLC and the Massachusetts Library System in 2009. The organizations work with libraries across the Commonwealth to make reading a part of summer fun for all ages. “Summer reading is fun, but it’s also an important part of students’ academic success because it helps them avoid the summer slide,” said James Lonergan, MBLC Director. Kids who read just four books over the summer do better on reading-comprehension tests in the fall than their peers who read one or no books over the summer. On average more than 350,000 people participated in statewide summer reading programs in libraries across the Commonwealth. To learn more about the benefits of summer reading, please visit ReadsinMA.org. The Summer Library Program is made possible through federal funding from the Institute of Museum and Library Services.